SoundRoots World Music & Global Culture: Monday's mp3: Bhangtronica, anyone? Devoted SoundRoots readers will know that I appreciate most attempts at cross-cultural musical fertilization. Just look through the archives; the examples are too numerous to count. Still, each time I face the ocean of multicultural mashups, I stick a toe in warily, for the waters are frequently treacherous. 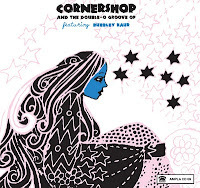 The arrival of Cornershop's new album Cornershop & the Double 'O' Groove Of found me in such a wary move. A plus is the vocals of Bubbley Kaur, a Punjabi singer whose reedy voice is up there in the range of Bollywood playback singers. A minus that becomes quickly apparent is that the album tries to evoke bhangra without dhol drums, instead using drumkit/programmed beats that just don't have the same juice. That said, this really isn't trying to be a bhangra album, and I know I need to allow some slack for the whole cross-cultural blend thing. So let's move to the bright side: Cornershop has created an energetic album full of catchy tunes here. And there's an odd variety, from the distinctly bhangra-flavored "United Provinces of India," to the offkilter military-march of "Natch," to the funky bass-driven "Double Digit." Though the album doesn't adhere to any one sound, it's consistent in pasting Kaur's voice over rhythm-heavy tracks. This could be both its appeal and its downfall. While I like all the tracks, I also haven't been able to listen to the album all the way through. I'd call it a collection of catchy singles that doesn't hold together as a whole album. But mix it up with other random tracks on your iPod, and you'll love it. FYI, latest.fm has nothing particular to do with Cornershop, but they do seem to offer a wide variety of Indian/Punjabi music for streaming and apparently (with registration) for downloading. It's worth checking out.